So what is all this rain doing to your garden loving heart? Are you just itching to get out and plant something? Well here are some ways to calm that itch through indoor seed starting, using Reemay floating row cover and setting up some plastic covered hoop beds. Now is a good time for cold season starts and, if you are patient, warm season crops like tomatoes. To start seeds indoors you need pots with good drainage, clean soil to plant in and a good strong light source. This can be a south or west facing window or better yet, a grow light of some sort. 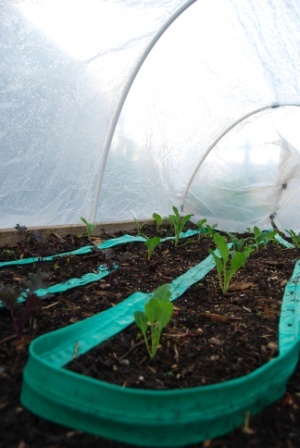 I also like to use a seed mat and a mini-greenhouse to get faster germination. 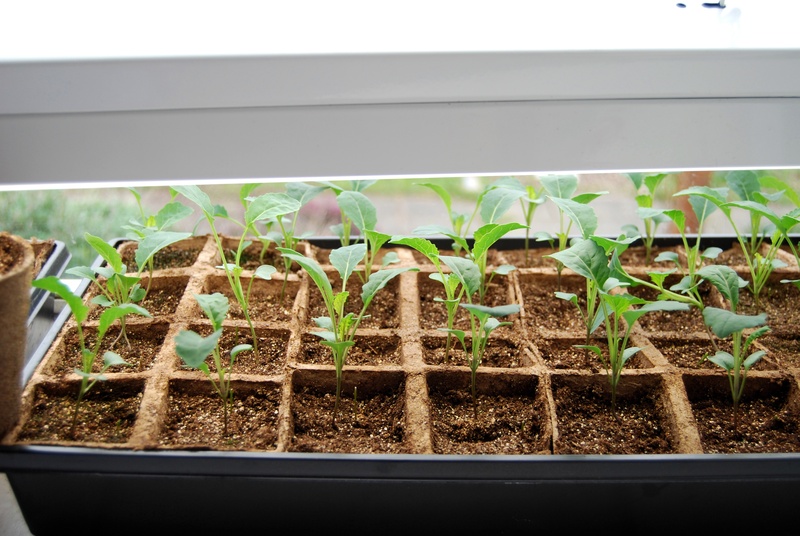 Once your seedlings are a few inches high you can start planting out the cold hardy ones like collards, sweet peas, kale and so on. The tomatoes, squash and other heat lovers need to stay inside until temperatures warm. I like to use Reemay to both protect the plants from frost and from the crows in my neighborhood that just love to eat juicy little seedlings. 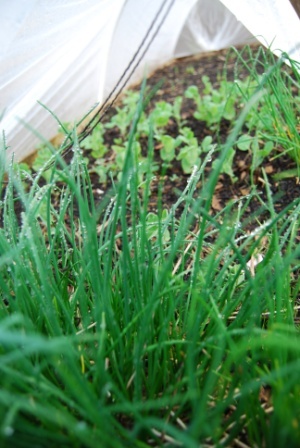 Reemay can also be used over newly planted cold season seeds, onion sets or potatoes. Because the Reemay is so light weight I usually weight it down with soil or rocks. You can also use metal pins if you have them. Using large binder clips keeps the Reemay from blowing away. If you want to create an environment that is drier and warmer than what you can make with Reemay the next step is to do hooped beds. I like to use one inch pvc pipe either bent over and put in to pipe brackets screwed to the outside of the bed or pushed deep into the ground. This creates a warm place for your plants that really can help them to thrive. One problem with these covered beds though is the issue of watering. You either need to set up an irrigation system, remove the cover on a warmer rainy day or hand water. 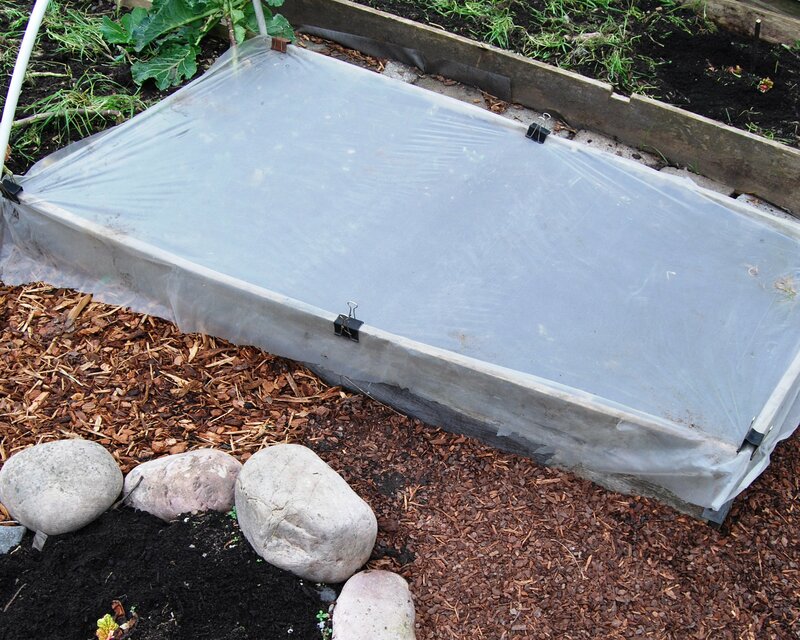 Plastic covered hoops over a raised bed with irrigation. Here’s a peek under one covered bed. The chives and peas are flourishing. I do hope the dog doesn’t figure out how to take the cover off; he loves to eat peas! Good luck to you and let me know how it goes with getting a jump on the garden season!